This is the quintessential coffee table book. That’s particularly true for those who love guitars. It’s packed full of amazing photographs of guitars of many rock stars. Not only do you get all the photographs, but you also get stories behind the guitars, the shoots and more. It should be noted that Lisa Johnson really has an eye for this. She doesn’t just take the typical pictures of guitars, but often brings things into a new angle or shows detail that might otherwise be missed. The list of rockers included here is like a who’s who of different genre. Since Music Street Journal started as an entirely progressive rock publication, let’s look at the prog artists first. There are guitars here belonging to Adrian Belew, Brian May, Geddy Lee, Ian Anderson, Steve Howe, Roger Waters, Alex Lifeson, John Petrucci, Steve Morse and more. When it comes to metal, you’ll find the guitars of Glenn Tipton, Michael Wilton, Dave Mustaine, K.K. Downing. The list includes some of the biggest names in music from Eric Clapton to Peter Frampton, Keith Richards and many, many more. 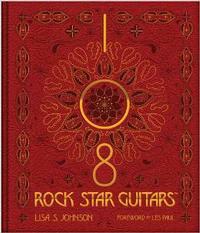 If you like photography books, guitars or both, you really must have this. It’s a classy book for sure.